Marinka dreams of a normal life, in which her house stays somewhere long enough for her to make friends. But her house has chicken legs and moves on without warning. She faces a lonely destiny as a Guardian of The Gate between the living and the land of the stars. The only people she meets are dead; they disappear when her grandmother Baba Yaga (from Slavic folklore) guides them, with warmth and kindness, in a nightly ceremony, acting as a kind of midwife of death. Marinka wants to change her destiny, but her house has other ideas. What inspired The House with Chicken Legs? My grandmother told me fairy tales about Baba Yaga and her house with chicken legs when I was young. Some of the stories were terrifying, but they fascinated me too. 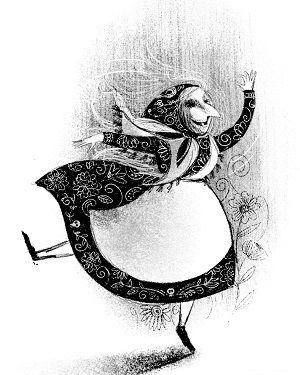 Baba Yaga is much more than your average fairy-tale witch. She can be cruel, but also kind and compassionate. I wanted to explore this side of Baba Yaga, while giving her a role that explained people’s fear of her, and her links with death. The house in The House with Chicken Legs ended up being similar to my grandmother’s home: filled with memories of the dead, but also a celebration of life; brimming with delicious foods, beautiful music, and wondrous stories. Marinka was initially inspired by my children, who also dream of climbing over fences and carving their own destiny. But as soon as I started writing Marinka, she became incredibly real to me. It felt like her world and her story already existed, and I had simply discovered a window into it. The House is a fully formed character in your book, alongside Marinka, Baba Yaga and the rest of the cast. If you had a house with chicken legs for a day, where would you go, or what would you do and why? I loved writing the character of the House probably because it’s most like me. I love music and travel and playing games. The House wants to have fun with Marinka, but wants to protect her too, and sometimes those two desires aren’t compatible. As a parent, I can relate to that feeling. If I had a house with chicken legs, my house would be very old, but still full of life, and well-worn, but in a comfortable way. I have always wanted to see the places that inspired my grandmother’s stories. So, I would sit on the house’s roof as it ran over the fells near my current home and the Welsh hills of my childhood, splashed through the English Channel, and galloped all the way across Europe to the enchanted forests, lakes and seas of my grandmother’s first home. But I wouldn’t stop there! There is so much of the world I would love to see; northern lights and narwhals, baobabs and bears, snow monkeys soaking in hot springs and migrating monarch butterflies. The house and I would samba in the streets of Rio, fire dance in Fiji, dip into the Dead Sea, and amble under avenues of cherry blossoms in Korea. I’m not sure I could do all that in one day, but it would be fun to try, and it would certainly inspire some new stories! The story deals with both dark and light themes – what message would you like readers to take away from the book? That life is full of joy and sorrow, loneliness and companionship, pride and regret. To live means experiencing it all. Some things might feel heartbreaking, but they can never truly break your heart. There is always hope for a brighter future, and you might find it in the most unexpected of places – in an encounter with a young friend or an old Yaga, in a house that you thought was your enemy, in the beak of a bird, or in the ripples on a puddle’s surface. Even death can inspire us to embrace life. I hope my readers try to appreciate every moment – whether light or dark – and keep striving for happiness. We can shape and mould our futures, and the possibilities are as endless as the stars! And you can buy your copy of The House with Chicken Legs by Sophie Anderson here.